The Cave B Estate Winery and Spa Resort is a surprising dash of rustic elegance in the harsh, dry elements along the Columbia River Gorge outside the little town of Gorge, Washington. Cave B offers many things for many people: its own wine, fine dining at Tendrils Restaurant, lodge, spa, outdoor swimming pool, and different types of accommodations that include the Desert Yurts, Cliffehouses, Cavern Rooms, and inn suites. The resort is also located immediately adjacent to the remotely located Gorge Amphitheatre music venue, which can either be a great way to sleep after a big concert or else an annoyingly loud neighbor if you’re not there for the music. 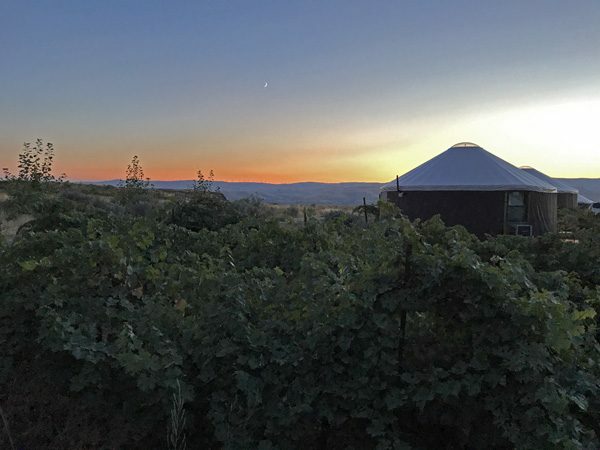 The Desert Yurts are classic soft-sided yurts with circular skylight at the top, windows, and doors. Cave B raises them beyond basic accommodations by adding air conditioning, a nicely appointed bathroom, cozy king bed, kitchenette, and other amenities. However, these yurts are also the rougher of Cave B’s offerings; they are reached by dusty, rutted dirt roads and there is practically no sound insulation. Very surprisingly, the Cave B landscaping crew swung into action at 6:30am on their lawn mowers, and it was very apparent to any yurt dwellers without ear plugs. Nonetheless, the yurts are fun and more affordable alternative to all the resort’s other pricier options. Tendrils Restaurant offers fine food with a great view of the Columbia River Gorge. If there is such a thing as best french toast anywhere, surprisingly they served up the best french toast I have ever eaten. 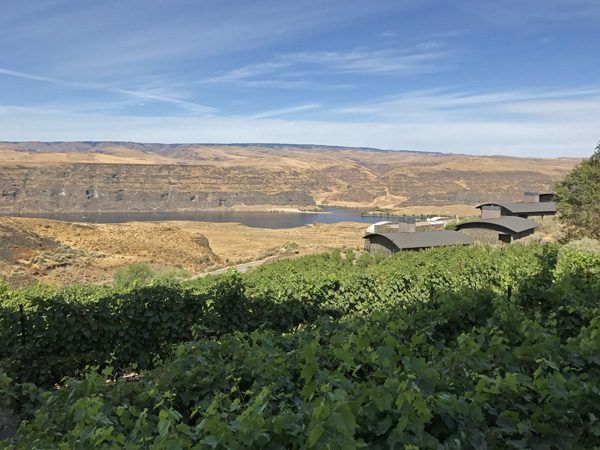 Cave B also owns a very large swath of land that extends from the resort’s clifftop location, down to a lower flat plateau, and then further down to the shores of the Columbia River. A good set of hiking trails and loops exist for several hours of walking around, though it is recommended bringing their map for occasional reference. 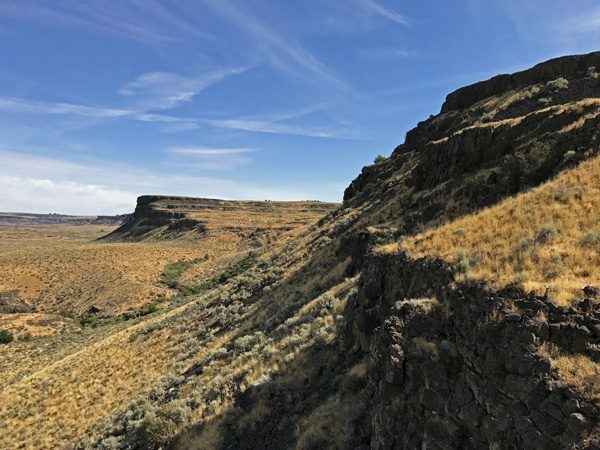 Along the way is a year-round waterfall and creek, basalt geological formations, remains of an old homestead, and views.